Send well wishes with a basket full of the comforts of home. This gift basket is perfect as a message of congratulations on a job well done, to lift the spirits of someone who needs a pick-me-up, or as a housewarming present. Filled with scrumptious items like cheese and crackers, sausages, nuts, olives, chips and more, this gift is sure to hit the spot. 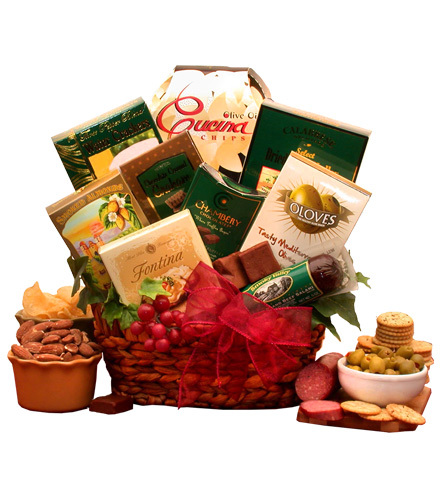 The Comforts of Home Gift Basket includes: Three pepper water crackers, smoked almonds, Fontina creamy cheese spread, chocolate covered graham crackers, 3 oz beef summer sausage, pimento stuffed Mediterranean olives, cranberry harvest trail mix with nuts, Bistro style cuccina chips. This gift basket comes in a natural seagrass wozen basket adored with grapes and leaves. This gift basket measures 11" long by 8" wide and is 14" tall, weighs 4 pounds.